I don’t think anyone can argue that Crush of Finding Nemo has an excellent way of parenting. He’s totally chill, has a great relationship with his youngest son Squirt, and even gives some parenting advice to Marlin, Nemo’s dad. Last month I spent an adventure-filled afternoon in Disneyland and California Adventure as part of the #DisneyInHomeBloggers. 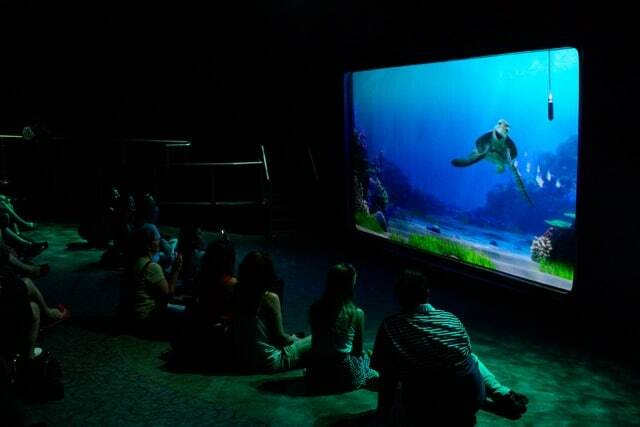 There’s an interactive Finding Nemo attraction in California Adventure called Turtle Talk with Crush. It’s been in California Adventure since 2005, but this trip was the first time I had been in Disneyland since 2000. California Adventure did not even exist yet! For about 20 minutes, we got to have an actual real time conversation with Crush. He asked us questions about the human world, and in turn we got to ask him anything we wanted to know about himself or his life under the sea! 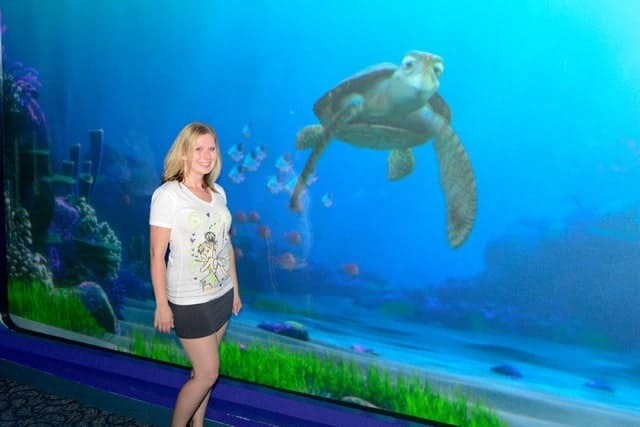 Every time park hoppers check out Turtle Talk with Crush, they will be getting a completely unique experience. I would love to just hang out at Turtle Talk with Crush for a few hours with several different groups just to see how the conversations vary. When we walked into the room where we would talk with Crush, I felt as if I were in an aquarium. Crush’s “tank” is floor to ceiling, so not only did we get a full view of Crush, but we also got to see a very small part of the ocean that he calls home. Crush swims around, does flips, and even changes his facial expressions to match his emotional reactions to anything that we said. I had no idea whatsoever what to expect for Turtle Talk With Crush, but let me just say that this far exceeded the idea that I had pictured in my head! Finding Nemo 3D is in theatres everywhere September 14th! Find out all the latest Nemo news on Facebook! We’re AP to DL and DCA and every time we know this is a must for our 10 year old and Disney Jr Live is a must for our 2 year old. It is a lot of fun, they interact with the kids but also the parents. Its also a great place to have a rest in AC and regroup! Oh what fun! Loved the movie! I bet you had a blast, Stacie! What a great looking show. If i ever go to disney Land i will check it out. on a purely side note, I STRONGLY recommend flu shots before going… a strain was going through the park and our 7 day vaca only had 3 days spent in the parks due to extreme vomiting and other fun things..lol..by 3 of my 4 children. I had nieces and nephews go down as well as both of my sisters.. NOT a fun time.. next time… I am taking more hand sanitizer and shots beforehand! This is a really awesome review! I enjoyed this, I had no Idea this of this place. Now I want nothing more then to take my family there. Man how neat is this and you pic are amazing…up close this rocks! Thank you for the interesting review! Wow this sounds great and I think the whole family would enjoy it. What an awsome journey to be able to take your children on! My son would love this. He loves all this aquatic! You do so many fun things! Thanks for another fantastic review!